The Southwest Companion Pass is magical. It allows you to designate a companion who can fly with you for free on each flight you take for the remainder of the year you earn it plus the next year. If you maximize this benefit you’d be able to get nearly two years of two-for-one flying on Southwest. Plus, as part of earning the Companion Pass you’ll also rack up a significant balance of Southwest miles. 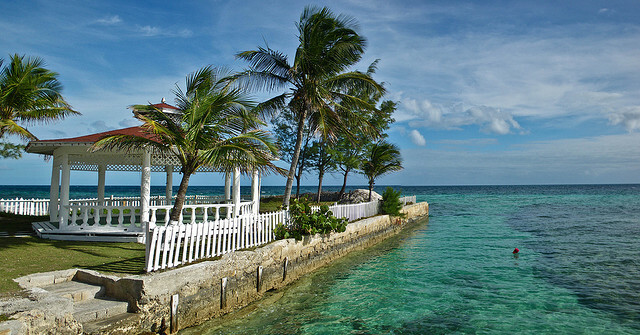 With the Southwest Companion Pass your companion can fly for free with you to the Bahamas! 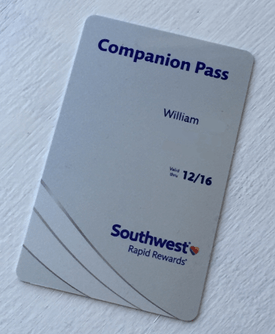 Unlike other airlines that sometimes issue “companion passes” as a one-time coupon for a discounted fare, the Southwest Companion Pass is extremely simple to use and isn’t bogged down by fine print or complex processes. Once you have your Companion Pass you simply designate your companion by name. Then when you book a flight with Southwest, whether paying with miles or cash, you’ll click a button to add your companion to your itinerary. That’s it. When I first tried it I figured I was missing something because it was too easy. To be clear, by the end of this, you’ll have 110,000 Southwest miles and you’ll also be able to take a companion with you for free! I earned the Southwest Companion Pass in 2014 which meant that my wife was able to fly with me for free during 2014 and 2014. During this time we took trips to Seattle, Las Vegas, Boston, Philadelphia, Chicago, and Cancun. We were both able to fly to all of these destinations for less than $300 total! If we’d bought those tickets on our own without miles and a Companion Pass we would have spent over $3,000! Don’t worry, I’m going to explain exactly what we did and how you can earn your own Southwest Companion Pass. I’ve also helped three family/friends earn Companion Passes so the method below definitely works. Southwest gives you two different methods for earning the Companion Pass. You can either fly 100 one-way flights in a calendar year (no thanks) or you can earn 110,000 qualifying Southwest points in a calendar year. As I’m sure you guessed, you’re clearly going to be earning your Companion Pass by earning 100k Southwest miles. If you’re new to the miles game you’re probably thinking that’s a ton of miles, but don’t sweat it – Chase has got your back. Chase is constantly offering credit cards which allow you to earn 50,000 Southwest points that count toward the Companion Pass. With two of these cards you’ll receive 100k Southwest points quickly. 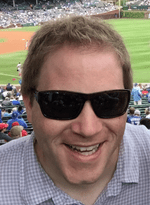 Note: The sign-up bonus on the Southwest cards often fluctuate between 25k and 50k. If you’re looking at this during a time when the sign-up bonus for one of the cards is only 25k you should probably apply for one card now and wait to apply for the second card until the bonus increases. For my credit card applications I applied to both Southwest personal credit cards within minutes of each other. If your second application goes pending you should call the Chase reconsideration line at 888-245-0625 and ask if there’s any additional information you can provide. Usually this call will get your application approved. You could also opt to apply for one card now, and a second card in a couple of months once you’d reached the minimum spending on the first card. Once you get approved for both cards you’re going to need to meet the minimum spending thresholds in each. Check the conditions of your offer, but typically you have to spend $2,000 on the card within three months. The sooner you complete this the sooner you’ll get your points. If you have Ultimate Rewards points from a prior Chase credit card then you can obtain Rapid Rewards Points, but you can’t transfer directly! Points transferred directly from Ultimate Rewards to Southwest Rapid Rewards won’t count toward your pass. However, you can transfer from Ultimate Rewards to Hyatt and then to Southwest. Unfortunately, you’ll lose points along the way. You’ll need to transfer 12,500 Ultimate Rewards to Hyatt points and then transfer those to Southwest at a 25:12 ratio to end up with 6,000 Rapid Rewards. Marriott offers the ability to transfer its points into many different programs. You can transfer 20k Marriott for 5k SW RR or 30k Marriott for 10k SW RR. I don’t necessarily recommend this, but it’s not a terrible option and depending on your usage for Marriott points it could make sense. Shopping portals are a great way to earn extra points, and the Southwest Rapid Rewards Portal is no exception. When I was working on obtaining my Companion Pass I conveniently needed to re-order my contact lenses. I spent $655 at 1-800 Contacts with a 4x earnings via the Portal so I got that plus my 1x on the card for general spending, effectively earning me 3,275 Rapid Rewards points from that one transaction for something I needed to buy anyways. Personally, if you have the spending to do so, I’d opt to use the shopping portal as much as possible while just earning the additional points via spend. The Southwest Companion Pass is valid for the remainder of the year earned plus the following year. I’ve managed to earn it two years in a row! You can change your designated companion three times. So the 4th person to be your Companion is your final companion. You can cancel any Southwest flight up to 10 minutes before the flight and get your points back. This is awesome. When you book your companion on a flight you’ll still need to pay the 9/11 security fee which is usually around $10. Somehow I think you’ll manage. As you can see the Southwest Companion Pass is pretty amazing and it allowed my wife and to take trips we probably would not have taken otherwise. What are you waiting for? With many great domestic stops plus increasing internationally options it’s time to grab two credit cards, get an additional 6k points, and go enjoy your free travel. My wife will definitely be earning the Companion Pass next year to keep our travel itinerary packed. Photo credit to Bryce Edwards. Best time of the year to spend that last of the 6000 to get the companion pass to guarantee close to 2 years of use? Unfortunately all 110k points need to be earned in the calendar year that you want to start the Companion Pass. The most ideal would be making your spending on the card in December (after December statement posts) so that all of the points post with your January statement. You can expect the points to post to your Southwest account a few days after the statement date.